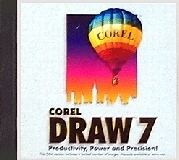 Corel Draw 7 is full featured Drawing program, desktop publishing, and profesional photo image editing. The Select version includes Corel Draw and Corel Photo-Paint, which are full versions of these two programs with all their features intact. Corel Draw is the worlds most popular drawing program and is used by millions of people across the world. The Select Edition also contains over 450 ready-made templates that will help you to create professional looking graphics with ease. In addition, for those of us who can't spell as well as others who never seem to come up with just the right word, the Select Edition comes with a Spell Checker and Thesaurus built in. The Select Edition differs from the standard edition in that it contains a smaller graphics library, fewer fonts and does not include some of the additional programs. The main improvement in Corel Draw 7 is the addition of a property bar. This interactive bar displays options and settings that are context-sensitive to the object selected. For example, when drawing a box, the property bar displays options for the curve on corners, positioning, scaling and other details. If you click on a bitmap, the bar offers options such as re-sampling and editing, as well as colour adjust- ment which alters the hue, saturation, and brightness. With this bar, all the options are at your fingertips, so there is no need to search laboriously through menus. "Corel Draw 7 may be overkill for many users, but comprehensive resources and advanced easy-to-use functionality make it essential for any business from small companies with no design experience to medium-size and large companies, which will appreciate its range of features."